I was recently very interested in learning about computer vision and AI since it is all the rage today and has been upvoted to buzzword heaven in the media. I decided to dive in head first and create some software that utilized this budding new technology. After some thought I came up with an idea that to my knowledge hasn’t been done before and would be easy enough to implement. 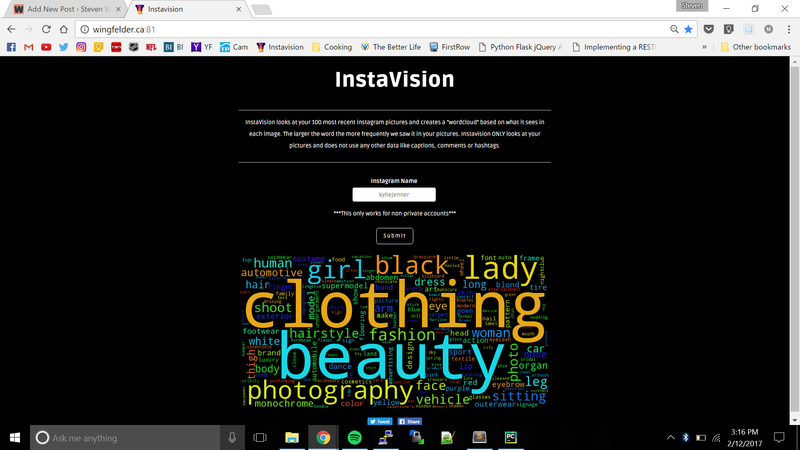 Concept: Create a “wordcloud” using a person’s Instagram pictures as the input. This was the concept that I came up with after a few iterations and pivoting because of some technical roadblocks along the way. The original idea was to give the user a personality assessment based on the Instagram media that they “liked” or “hearted.” This proved to be too difficult based on Instagram’s insanely strict API terms of service. This may be something I look at in the future. The first step was to get the pictures from Instagram. I decided not to use the legit Instagram API at all because of the ridiculous restrictions. Next was the actual AI and Computer Vision portion. I used the Google Vision API to analyze the pictures. 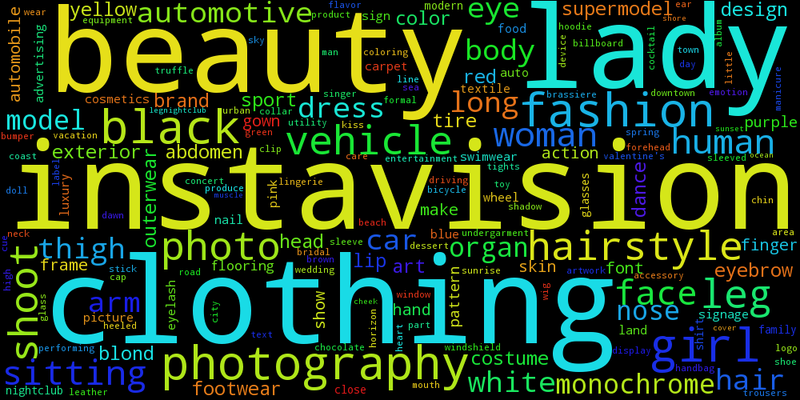 This works by sending the pictures that we scraped above to Google and they send back a list of words that their Cloud AI “saw” in them. This was all relatively easy and now the backend was complete. Presenting this to the users turned out to be the hardest part of the project mostly because I have little to no experience in web development. After some research I decided to use a python web framework called Flask to create the web app. I used apache2 to serve the HTML5 template and then Flask to handle all of the backend calls on my VPS. The final product looks exactly how I envisioned it; simple, sleek and functional.